EMS – You don't have to be a Doctor to Save Lives!! 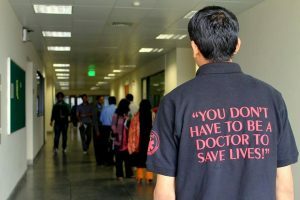 LUMS Emergency Medical Services (EMS) is a student-run department that was formed with 11 initial members in 2008. The first batch of students took basic first aid training from Rescue 1122 and thereafter set up LUMS EMS to provide medical care and pre-hospital treatment to other students at LUMS in case of an emergency. The entire team works tirelessly and relentlessly to ensure that no medical emergency on campus goes unattended. Today we have over 40 active volunteers and their continued devotion to the cause is what keeps the entire department running smoothly. After the Kashmir earthquake in 2005, there was a distinct realisation that there is a lack of awareness about emergency handling in Pakistan. It was because of this that a group of students at LUMS decided to form an organisation that could cater to such scenarios within the university campus. Ever since we have hoped to spread this vision to educational institutes across the country and our ultimate aim is to inculcate in the youth of Pakistan a social consciousness regarding health care and first aid.